ISBN 9780763690458. LOVE, Jessica. Julian Is a Mermaid. illus. by Jessica Love. 40p. Candlewick. May 2018. Tr $16.99. ISBN 9780763690458. PreS-Gr 2— Young Julián lives with his abuela and is obsessed with mermaids. He imagines taking off his clothes, growing a tail, and swimming freely through the blue-tinted water with swirls of fish and stingrays. 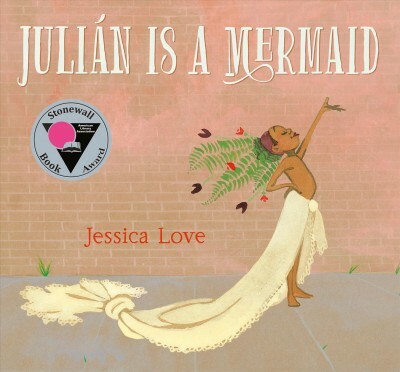 After spying some women on a train dressed as mermaids, Julián later tells his abuela, "I am also a mermaid," then proceeds to wrap a curtain around his waist as a "tail." Ferns in his hair complete the fantastical look, and when his grandmother catches him —is he in trouble? Not at all! In fact, she takes Julián to a festival where people are dressed as fantastically as Julián. Love couples the spare narrative with vivid, imaginative, and breathtaking illustrations. VERDICT A heartwarming must-have for one-on-one and small group sharing.